The Gamma Pledge Class of Winter 2015 are officially here after the formal Pledging Ceremony! Welcome to the fold. 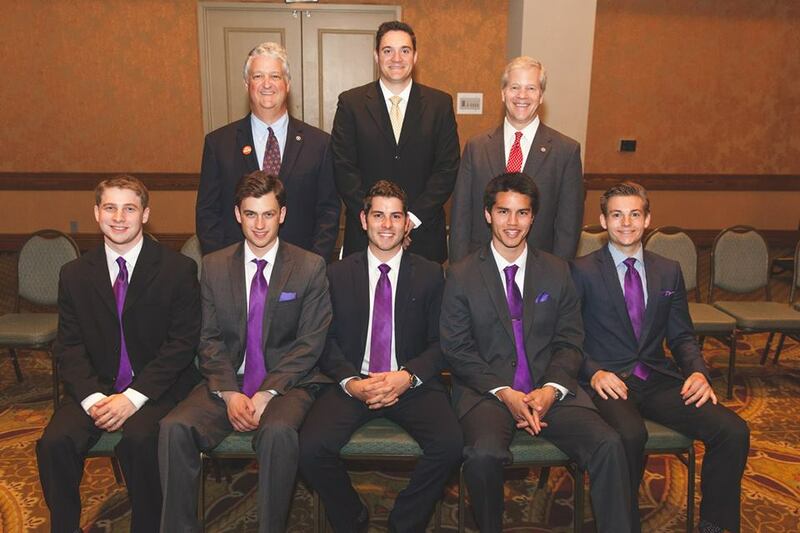 Pictured, from left to right: Michael Hagel, Thomas Erickson, Joey McHugh, Kris Björnson, Anton Maralit, Conor Rodriguez-Scott, Sam Schenk, Alec Pobiega, Kyle Jonsson, James Byers, Mons Roll, and Andrew Lai. The Gamma Pledge Class of Winter 2015 after the formal Pledging Ceremony. "This summer I had the pleasure to work for a political consulting firm in Las Vegas, Nevada called November, Inc. Their clients include current Nevada Governor Brian Sandoval, State Senator Mark Hutchison, and United States Senator Dean Heller. This was a great opportunity for me to be able to work with such prominent political members of Nevada. The majority of my work was in relation to the Governor's re-election campaign and Mark Hutchison's campaign for Lt. Governor. This work would vary from day to day. Some days I would go out into neighborhoods of Las Vegas and knock on doors to urge people to vote in November, while other days were filled with fundraising calls and staffing Governor Sandoval and State Senator Hutchison at varies events around the Las Vegas valley. I attribute my success of this summer to the older members in the fraternity for always pushing me and making sure I am on the correct track to achieve my goals and represent FIJI in the best ways possible." With school around the corner, we just wanted to let you all know that our Fall Rush calendar will be published by next Wednesday!